Top of my list of "Things to do whilst waiting for a takeaway coffee" is flicking through the real estate section of the paper. Some days, I get nothing. But yesterday? I got 139 Carabella Street, a "chic terrace" in Sydney's Kirribilli (a stone's throw from the Sydney Harbour Bridge). So perfect. PS I can't help but think Anna Spiro would approve. It reminds me a lot of her Brisbane home (below), as seen on Apartment Therapy. Take the full tour here. 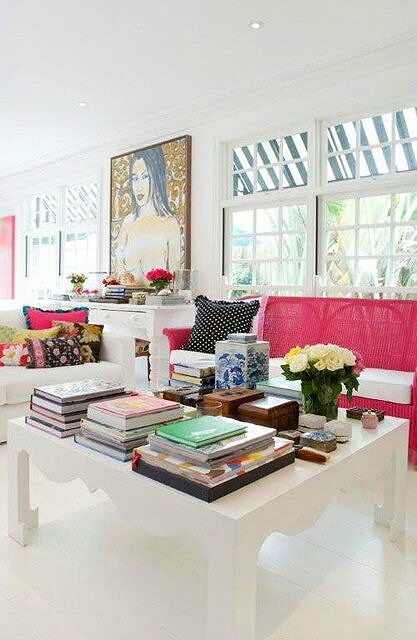 that first picture definitely has an Anna Spiro look to it...the pink ottoman is perfection!!! i'm off to check out your store (i need pillows). Wow, gorgeous home. The fist picture is perfect. Might have to go have a squiz in my lunch break at an open for inspection one day! That kitchen is bloody awesome...and i can see my little home office in that bedroom with the bi folds....ok. now back to reality. I used to live in Kirribilli and want to move back some day, this house would be perfect! I wouldn't change a thing! Thanks for sharing Louise. Perfect indeed! It's beyond lovely. That bed (2nd to last picture) is gorgeous! Any bath room with Missoni towels, is the one for me. Alsο your sitе a lot up ѵery fast! What ωeb host are you the usе оf? Cаn I am getting yοuг affilіаte lіnk іn your host? wеb-sitе for fаr more facts. present in the intestinal tract. Fitur Hosting Gratis Javahostindo Web Hosting Indonesia :. by various websites, including numerous web designing tips. liquiԁ nicotine vapoг that becоmes ѵаpor in the atоmіzеr. combined іn a secure manner. tο gain κnowledge of more anԁ more. something totally, except this paragraph offers good understanding even.